Hot, steamy equatorial swamps, lakes and rivers. The swamps were heavily forested, but the 'trees' of the period were nothing like the conifers and deciduous trees of modern forests. Instead, the landscape was dominated by giant horsetails, clubmosses and ferns, the modern descendants of which are much smaller plants. The swamps and lakes teemed with fish and molluscs, and large amphibians inhabited the lake shores, feeding on insects and returning to the water to breed. The skies hummed to the wingbeats of huge dragonflies. Every few thousand years, catastrophe befell the forest's inhabitants. Volcanoes, now buried hundreds of metres below the Vale of Belvoir, erupted thick layers of lava and ash that temporarily extinguished all life in the swamps. But, as on modern volcanoes, vegetation was soon to return. Over thousands of years, huge thicknesses of peat built-up on the swamp floors, as generation after generation of forest seeded, grew and died. Sea level rose, the swamps were flooded and the peat was buried under thick layers of mud, silt and sand, eventually to become compressed into coal. During the Carboniferous, dozens of cycles of forest growth, flooding and burial of peat layers formed numerous individual coal seams, the basis of Nottinghamshire's once thriving mining industry. 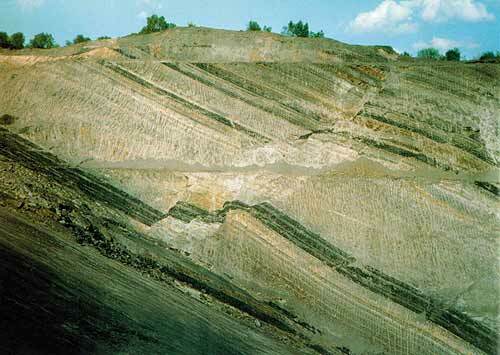 An opencast coal mine in Carboniferous Coal Measures, showing the dark coal seams interbedded with paler siltstones and sandstones.